Research clearly shows that Poron Cellular Urethane is the very best cushioning material for insoles. Poron is also exceptionally light and durable. It does not harden like PVC foam, does not break down like Latex foam, and does not take a compression set like EVA foam. 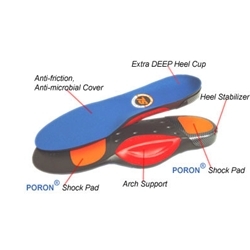 Poron is used in the most critical forefoot/heel areas. The insole's anatomically shaped extra deep heel cup and arch match the ideal contour of the human foot, which maximizes the foot's contact with the surface area of the insole. This feature helps increase cushioning by spreading the Peak G Forces and the body's weight over a greater surface area. 10-30% Lighter than other performance cushion insoles. Anatomically shaped arch (next to the foot) features a separately molded unit (on the bottom), which work together to support the medial arch. External heel stabilizer and heel cup increases heel support to improve lateral stability. To insure the toes are not crowded, the toe area of the insole has a tapered toe which decreases in thickness. To achieve a proportional fit, the heel & forefoot thickness of the insole is adjusted by size. For example, the Women's size 6 insole is smaller so it is designed to be thinner in the heel & forefoot than the larger Men's size 13. This is an industry first! The addition of BioStatic anti-microbial to the ETC top cover helps keep the insole odor free.